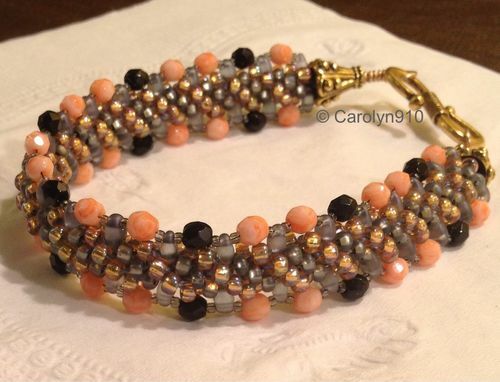 I made this bracelet for the October 2013 Operation Tackle That Bead Stash blog challenge. It uses 8/0 seed beads, twin beads, 4mm Czech firepolish, 15/0 seed beads, Fireline, and S-Lon/C-Lon Tex 210/bead cord. I designed this pattern myself but it is a parallel development to one by Sally Battis.